Whether the weather says so or not it is summer and everyone's jetting off to exotic locations over the next month to enjoy the hot weather if not staying at home. One of my favourite parts of getting ready for a holiday is picking up some new pieces for my wardrobe with some items I just have to pick up year in year out as they are perfect for the summer and so I thought I'd share them with you today. Maxi dresses are super for summer especially for someone like me who wants to stay cool but still wants to be covered up. They are great for casual shopping days out as well as many being able to dress up for a night out on holiday. They are a super diverse piece to have. JD Williams have a great selection of maxi dress for going out as well as casual days, for example, the one shown in picture 1 and 2- I love the khaki green one which would be great for both summer and transitioning into autumn. They have a great selection that you can browse here. Similarly, ASOS have some great casual maxi dresses as in picture 4 but more formal maxi dresses are lovely for a summer wedding or garden party for example picture 3 which is from Topshop. Everyone seems to be loving the bardot trend and I'm no different. If you want a great selection of bardot tops New Look is the one. They have so many different styles including picture 1 which is a personal favourite. Picture 2 is actually one I own myself and is from Dorothy Perkins- so comfy and so summery. If you still haven't found the perfect bardot top, Boohoo is another great one to check out. They, too, have so many different bardot style tops including those in picture 3 and 4 which, I think, would both be great for any upcoming festivals. You can't go through summer without sunglasses. They are a serious staple if you want to be able to see over the next couple of months. I have a pair from ASOS that I've loved wearing this summer. Sadly, I can't find them but those in pictures 3 and 4 are other finds that I think would love great. 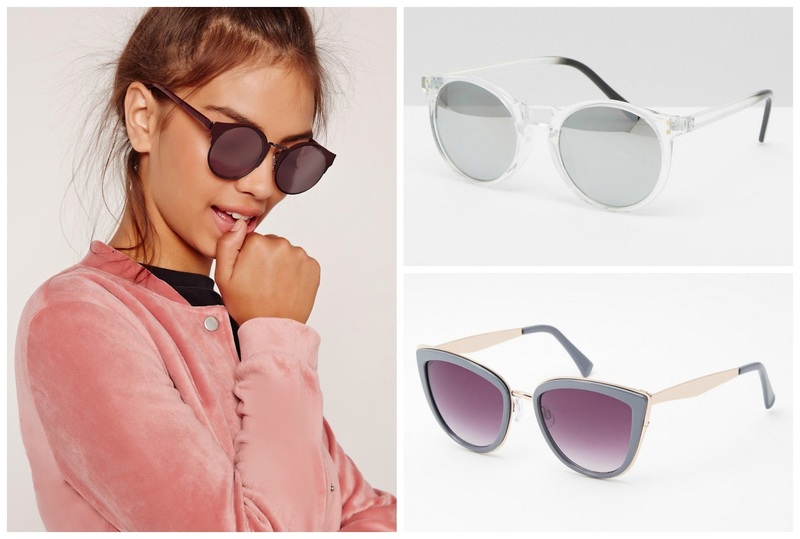 Missguided also has a few different sunglasses style if you ant some sunglasses that are a little quirky. I particularly like those in picture 1 which have a burgundy frame. Now, English summers are extremely unpredictable but a staple I invested in this summer was a light weight coat that I can wear in preparation for those sudden summer showers as well as not over-heating in the mean time. I actually picked my summer jacket staple while on holiday in Amsterdam but JD Williams have a great alternative(as shown in picture 1) that is very similar to the striking yellow coat I bought myself. Bomber jackets were another trend that has come into play over the past few months and even though they may be thick for the hottest days of summer, I, along with many, still love them. Picture 3 shows one from Topshop that I really like with the US patches. While this one might be a little warm on some days to wear, Picture 2 shows one from New Look that seems a lot thinner so great for the slightly warmer days. Finally, picture 4 is a jacket I found on ASOS and I love it. I love that it's something a little different with the peplum added to the bottom. It seems to be more of a thick shirt than a jacket so would definitely be wearable for this summer. So there are some clothing items that I feel are staples for this summer as well as a few suggestions as to wear to find them. If you're on the hunt for some summer/holiday clothing online, why not check out JD Williams. They have an array of choices at a range of different prices along with up to 30% off their holiday shop; there'll be something for everyone this summer. What clothing items are staples for you this summer? Hope you're doing great & Happy BEDA day 5!